I was fortunate enough to travel back to Spring Valley, Minnesota from Orlando, Florida for the final two performances of ‘Fade to Black’. Last night was a big success. More than 180 people attended, up from 152 the prior night and 102 on Opening Night. Despite the hot and humid temperatures (upper 80s, low 90s) in Spring Valley, people came out to learn about the disappearance of Jodi Huisentruit – and they brought questions. The audience had some great questions for our team after the performance. The performance started at 7:30 with a welcome from Brave Community Theatre Director Debi Neville. The lights darkened and Jodi Huisentruit (played by Sarah Kohn) emerged to begin the story of her last days through excerpts of her personal journal. The first act, ‘The Disappearance’ walked the audience through the weekend Jodi went water-skiing prior to her disappearance, her various run-ins with viewers, admirers, possible-stalkers and those closest to her. The talented Brave Community Theatre cast members played several roles throughout the performance capturing the persona of friends, colleagues, rivals and more. The first act lasted about just over an hour. A 20-minute intermission allowed attendees to enjoy some lemonade and (delicious) cookies and ask questions and converse with our team about several theories surrounding Jodi’s disappearance. 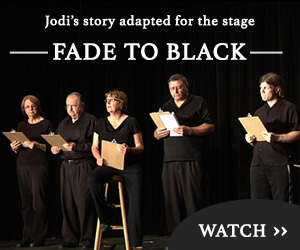 The cast of Brave Community Theatre’s production of “Fade to Black” are ready to present the play about Jodi Huisentruit from June 27 to 30. In front, from left, are George Colbenson, Patrick Cunnngham and Debi Neville. In back are Aleta Capelle, Debi Neville, Bonnie Austin, Gary Peterson, Sarah Kohn, Linda Niemeyer, Sam Gove, Roger Svebakken and Kelvin Niemeyer. The second act, “The Investigation” was chalk full of information related to persons of interest, leads and much more from our FindJodi.com, Inc. investigation. It illustrates how we initially got into the investigation by responding to a psychic’s advertisement for a free review of any case of our choosing. The cast effectively delivered dates, times and actions the authorities took in their investigation in the case early on and proceeded to illustrate the growing frustration from the community, family and friends at a lack of progress in finding the abductor(s). The performance wrapped just after 9:00 p.m. and the audience quickly jumped into questions for the cast and for our team. The questions asked were very good and came from all ages. I had one, sweet little girl in one of the back rows ask ‘if anyone ever saw a license plate’. It was a good question, but sadly, no one ever did. Questions lasted more than a half-hour and the night winded down. Some attendees stayed after to ask even more questions. Many purchased former television news-anchor Beth Bednar’s book ‘Dead Air’ – The Disappearance of Jodi Huisentruit at a discounted price. Others donated to our cause by throwing a few bucks in our donation bowl – which is a giant help to our non-profit organization, FindJodi.com, Inc. I thank everyone dearly who did so. If you’d like to help us continue our mission, you can always donate here. Every dollar helps. And what made the night most special was the fact that Jodi’s sister Joanne Nathe and Joanne’s daughter Kristen were in the front row for the performance. It was great to catch up with them. They enjoyed the performance and we were so glad the made the trip from Long Prairie and the Twin Cities to be there and represent Jodi’s family. After all, our goal in solving this case is to help bring them closure and justice. Tonight is shaping up the biggest night of the 4-night performance. If you haven’t purchased your tickets, there is still time. If you do attend tonight’s final performance, we’d like to thank you ahead of time for your support. And we’ll see you at 7:30. Please bring questions. Those interested in the case and who support our mission may be the final chance Jodi has for justice. Thanks for your support and we’ll see you at the show! [+] If you attended a prior show, please leave a comment by clicking here and scrolling to the bottom of the page. You can read comments there as well. Please leave your comments here and let us know what you thought of the performance. Thank you! I attended the Friday Night performance, Fade to Black and found it very, very interesting!! I know Gary, personally and find he and his wife(Gladys) to be amazing giving people!! I also think that Deb Neville, whom I also know, did an amazing job of putting this story into play form! The ? and answer format was interesting, but adds alot more ?’s!! Josh was nice enough to answer my ? after the production. I found this more informative than any T.V show i’ve ever watched!! I know now, when I have that gutt feeling to call the police,no matter how stupid I sound or look, since I do see alot of people at work and alot of crazy things I will know to jot it down or call the police!! Thanks to all who remembered the lost’s memories, time may Fade but we should NEVER forget or give up!! Nice job Gary and Josh for all your hard work!! To the cast of Fade to Black You should all be proud of what you’ve done!! Maybe do more informative plays you guys and gals have it in you!! I hope someday, I’ll beable to bring the lost home because we all deserve to come home and have closer!! Awesome 1 out of 10 you people are off the charts!!!!!! Attended Thursday eve performance. Very well done and touching. As mentioned above, we should not hesitate to call for help if things seem “wrong,” We need to keep remembering Jodi. We attended the Saturday night performance… unlike anything I’d ever seen before. My mind was just spinning as we drove home and into the evening. 1. Was there ever any thought of having the California psychic consider the case of Bill Pruin? 2. Does Iowa have the equivalence of the Minnesota State Bureau of Criminal Apprehension? What role did they play in the investigation, and do they typically call out issues with murder investigations that the local police departments carry out? It just seems like the MCPD did not interview some pretty key witnesses in a timely manner. 3. I was amazed by the circles that Vansice traveled in and the strange (to me, anyway) social calendar that he kept… (meeting for walks at the mall, meeting for coffee at the convenience store, etc, etc). If he didn’t commit the act himself (which would possibly allow him to pass lie detector tests if given that direct question), it certainly possible and plausible that he would have possibly had some acquaintances of ill-repute that could have done the job for him (conspiracy). 4. If Jodi’s apartment looked like there had been some kind of event THERE where possibly the video was viewed (beer bottles in the sink, toilet seat up), there could have been a test on the VCR to see what tape oxides were last on the play heads of the VCR and to see if there was a match with the tape that Vansice gave the police. 5. The fact that the toilet seat was UP makes me think that a male entered the apartment (and used the bathroom) after Jodi left (unless the investigators bungled that). From my experiences, a female (and for that matter, I do too) goes to the bathroom before they leave the house, even if they’re in a hurry. 6. The journal being found in the basement of the former chief of police is very interesting… perhaps confirms some lackadaisical police work on the part of the MCPD. 7. If a jogger was out at that time of morning, why wouldn’t it be possible that Jodi had walked out into the middle of some other nefarious activity, and the perps felt the need to dispose of her. If that was the case, it was probably lucky for the jogger that they had already felt the need to get one person out of the way. Does the hand print periodically get re-checked against prints on record to see if there is a match with subsequent arrests? These are just a few of the questions that came to mind. I’m reading Beth Bednar’s book right now, and I’ll see if anything else pops. I have to admit that in addition to interest in the subject matter, I was curious about how Debi had scripted this play…very well done! The Brave Community Theater once again showed why they are such a stellar resource to the Spring Valley community. And a big thanks to you, Josh, and to Gary for keeping this investigation alive. I hope the play creates a new wave of thought and interest in this case and that it finally helps bring justice to bear on those who perpetrated it. It was such a pleasure to be able to work with the Brave Community Theatre on this project, “Fade to Black.” It has been a goal for me to attack this subject in an organized manner and hopefully bring those responsible to justice. In the weeks ahead Josh and I will be working on several leads that were brought forward during and after the question and answer portion. We will be going to a couple of locations in Iowa as a result of new information and we will continue to work with authorities in passing along any developments. Your donations will assist us this continued effort. Again, “Thank You” to our friends and followers as we move ahead. Gary, Sorry I couldn’t make it to MN for the performances. If you happen to bring the show to Los Angeles I’ll be there every night offering my support. I will be in central MN in August and perhaps we will have a chance to meet. Friday night. This was an awesome performance by all! Great idea. My 16 y,o, daughter and I attended. It really got us to thinking about this and talking about everything. Kudo’s for all of the actors and actresses. I am glad this is being looked into and am praying that it will be solved soon. Maybe it will lead to Billy’s killer also. Keep up the good work and God Bless all of you! People assume that a man used the toilet because the seat was up, but there are at least a couple of reasons a woman living alone might have a toilet seat up. Perhaps she was throwing up. That could also be why she was running late. Also I always lift the seat up if I’m cleaning the toilet, though that wouldn’t have been hard to figure out. The water might have been blue or the smell would be different. Having said that, I admit that it’s more likely that a man was using the toilet, but these possibilities can’t be discounted. Also not every female goes to the bathroom before they leave, particularly if they haven’t had children.